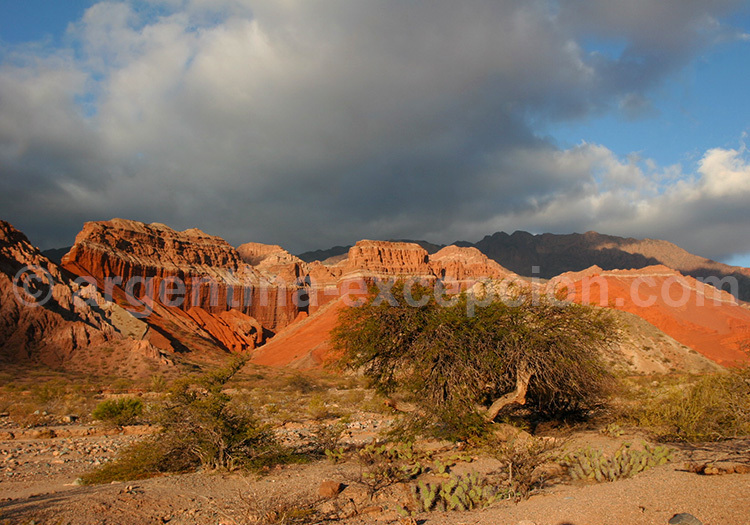 Information about the city and the province of Salta in Northwest Argentina, by our local travel agency. Our photos of the Puna region. 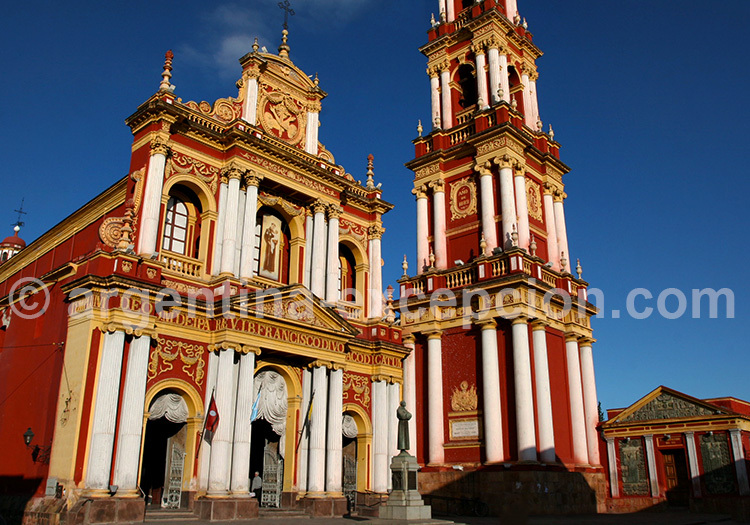 Known as ” Salta la linda ” (Salta the beautiful), it is the capital city of the province of the same name. Founded in 1582, it is one of the Argentine cities which has best preserved its colonial architectural heritage. Activity concentrates around the central park, the 9 de Julio. The cathedral and its pink and meringue facade keeps a typically colonial style. The beautiful Cabildo with its arcades and balconies, lodge the Historical Museum of the North. The church of San Francisco, from the XVIII century, imposes its red and golden facade in the adjacent street. For a global view of the city and a nice walk we can climb to Cerro San Bernardo, then go down to walk on the paved streets, and peek through some doors from old houses opening to delicious patios with flowers. 164 km (102 miles) northeast of Salta, San Antonio de los Cobres (5500 inhabitants) is one of the highest villages in the country, located at 3750 meters (12,303). The weather is dry and the winds are polar. This important Indian hamlet owes its name to the copper mines of the region. It also lives on the cultivation of quinoa, the typical Andean cereal, and of llama and sheep breeding, whose wool is used to make beautiful textiles. San Antonio de los Cobres is a stop on the route of the famous Train to the Clouds circuit. Each August 1st the Pachamama (Mother Earth) Festival is carried out, in which food offerings are placed in a pit symbolizing the Earth’s mouth. 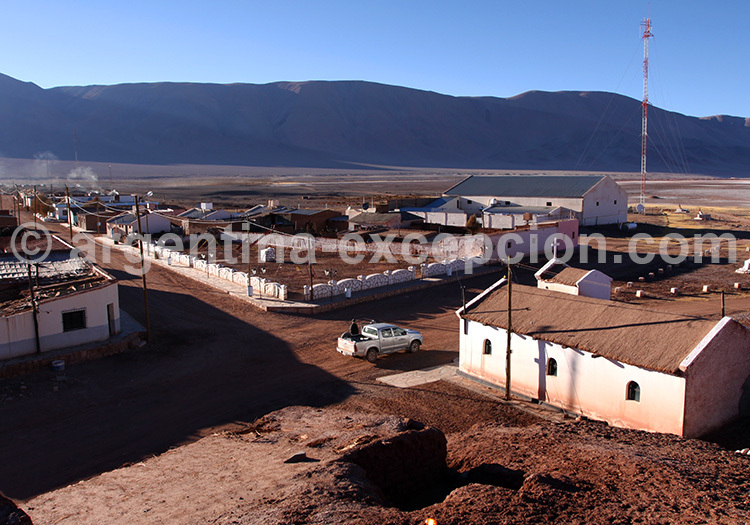 Situated between San Antonio de los Cobres (Argentina) and the village of San Pedro de Atacama (Chile), Paso de Sico is on the border between the two Andean countries, on route 51. 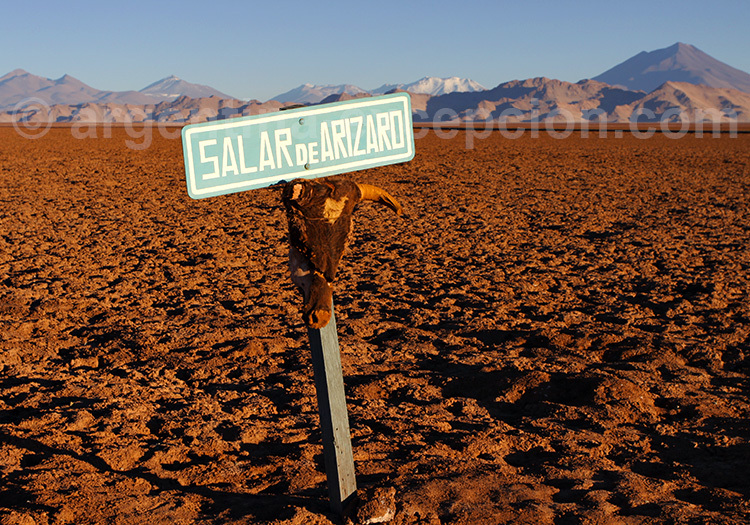 This border post is at 4079 m of altitude, and is very close to Salar del Bincon. To take this route, we recommend going on an ATV. A true wonder of engineering, the Train to the Clouds was built during the first half of the 20th century to join Argentina with Chile. It was a monumental work that demanded 27 years of labor. 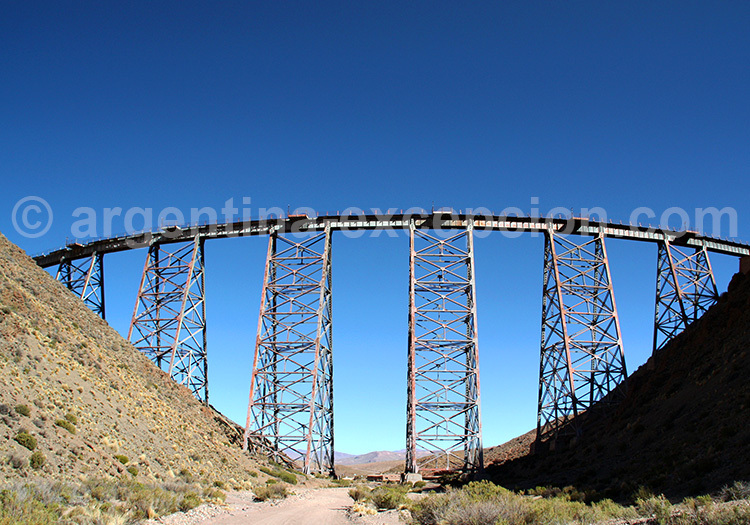 It begins its route in Salta, at 1187 meters (3894 feet), passing through the spectacular Quebrada del Toro, arriving at its terminal at 4220 meters (13,845 feet) making it one of the most elevated railroads on Earth. Along 217 km (135 miles), the train crosses 21 tunnels, 29 bridges and 13 viaducts, such as La Polvorilla. If mountain sickness and vertigo don’t overwhelm you at 4220 meters (13,845 feet), you’ll feel you can touch the clouds. The excursion lasts 15 hours (roundtrip). Some hundred kilometers from Salta on route 51 on the way to San Antonio de los Cobres, Santa Rosa de Tastil is the point of entry to the ruins, located 25 km from the village. 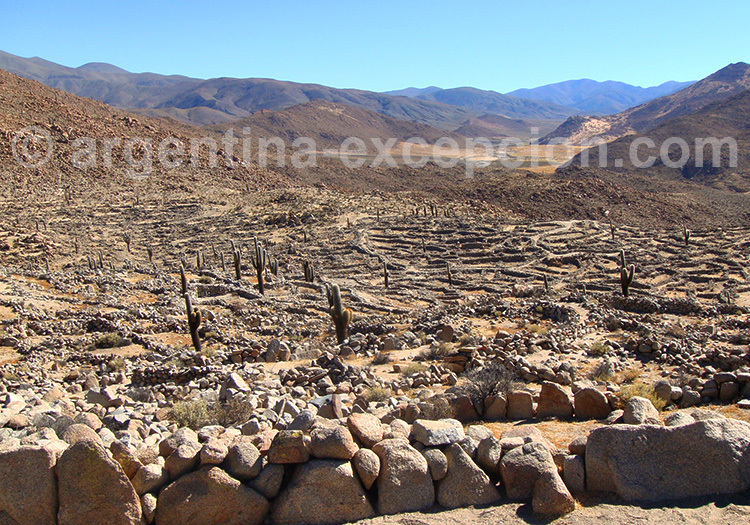 They are the most important Argentine ruins after those of Quilmes, declared Historical National Monument. Between 1300 and 1400 after Christ this site gathered 2000 inhabitants. Discovered in 1903 and renovated in 1967, the ruins reveal the existence of urbanization of 440 houses, streets, places, etc. A great number of objects has been discovered: ceramics remnants, missiles points, etc. Studies on this site have concluded that inhabitants from Tastil were excellent weavers, raised lamas, made stone objects and rustic pottery. 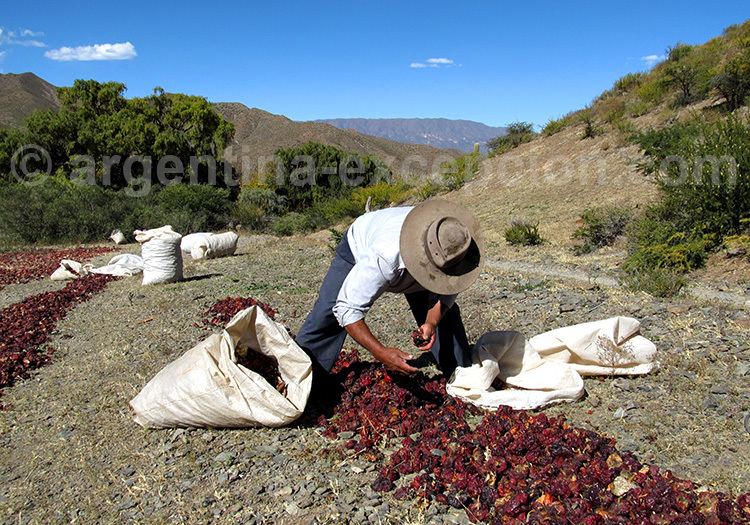 They traded with the neighboring Andean villages and cultivated agriculture plantations at the foot of the mountains. To the east of these ruins, we find numerous petroglyphs (designs engraved on the stone). These big stones are covered with geometric figures, zoomorphs and anthromorphes. 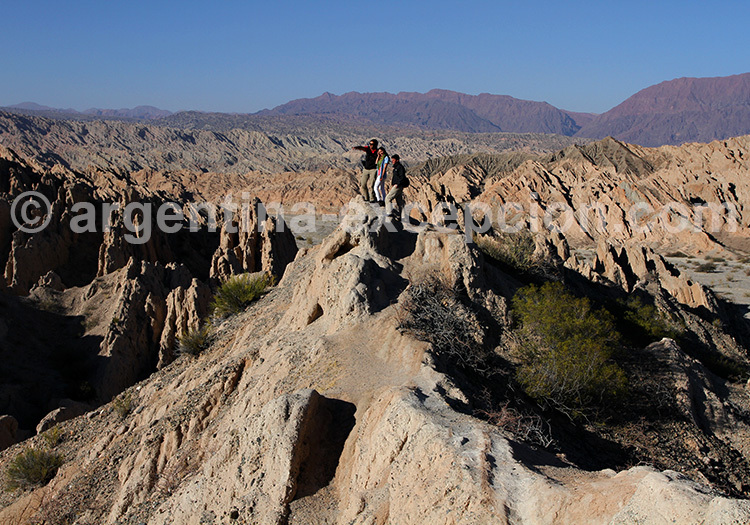 On route 51 which connects Salta to San Antonio de los Cobres, the Quebrada del Toro, of about sixty kilometers, offer magnificent paths for walking, going through some villages, varied landscapes and archeological areas. Their almost perpendicular walls are well eroded. Cactuses decorate the borders of the colorful mountains, which contrast with the green of the vegetation and the blue of the sky. Ideal trekking zone in summer, it is more difficult to access during rainy season. The beautiful route that joins Salta with the town of Cachi, in the southwest of the province, passes through Obispo’s Steep, a zigzagging path which ends at 3000 meters (9843 feet) before crossing Los Cardones National Park. Covering 65,000 hectares, this park owes its name to the Candelabro Cactus which can be found all through the region. This cactus reaches 4 meters (13 feet) in height. Its very solid trunk and branches are used to craft furniture, beams and handicrafts. In the past, around the extensive Recta del Tin Tin, this arid landscape was the home of an important Incan city. Today, only wild llamas can be seen. The route continues until Cachi, a lovely town that lives on tourism and the cultivation of pepper, located at the foot of Mt. Cachi, which reaches 6380 meters (20,932 feet). A few miles west of Angastaco, Los Colorados forms an enormous natural amphitheater surrounded by multicolored mountains in which bright red tones stand out. The statue of Cristo Redentor dominates the landscape, and the inhabitants of the area say that condors sometimes visit and fly over Los Colorados. 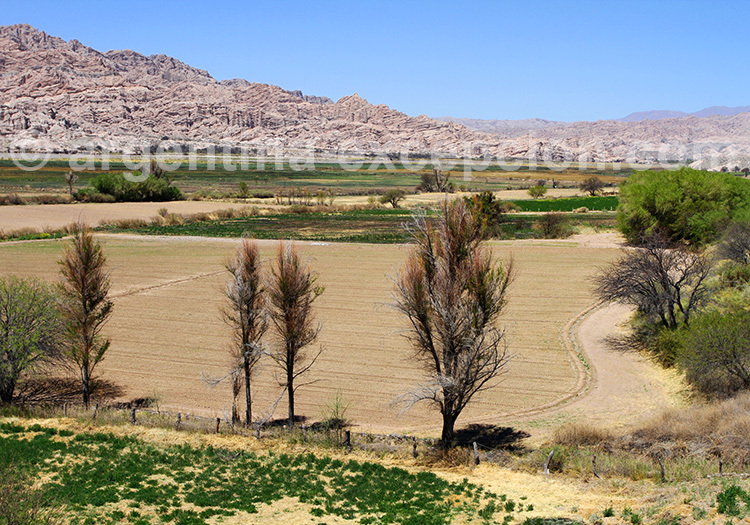 The Calchaqui Valley is one of the most beautiful regions in Argentina, extending over several provinces. Its name comes from the Calchaqui Indians, dominated first by the Incan Empire and then practically exterminated by the Spaniards after a century of wars. 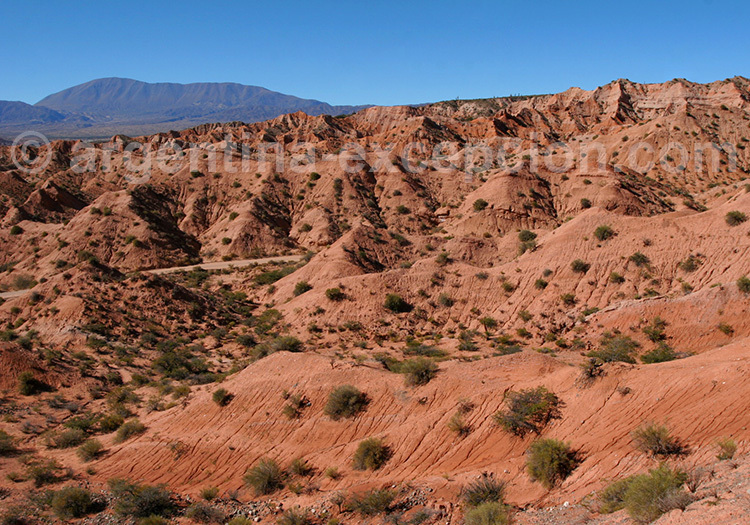 To enjoy a beautiful view of the valley, we recommend the Salta – Cafayate circuit. Westwards, take the famous Route 40, a rubble path which crosses Los Cardones Park, the towns of Cachi, Molinos and Angastaco, then the extraordinary Quebrada de las Flechas, always bordering the Calchaqui River. 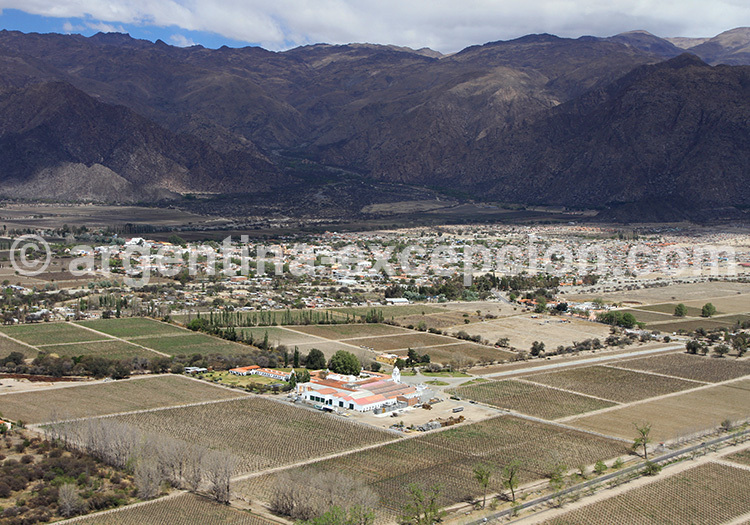 The first vineyards indicate the proximity of Cafayate and its wineries. Return via the east: the route, this time paved, crosses the strange formations of the Quebrada de las Conchas before reaching the green-toned hills near the Cabra Corral Dam, a typical tobacco region. 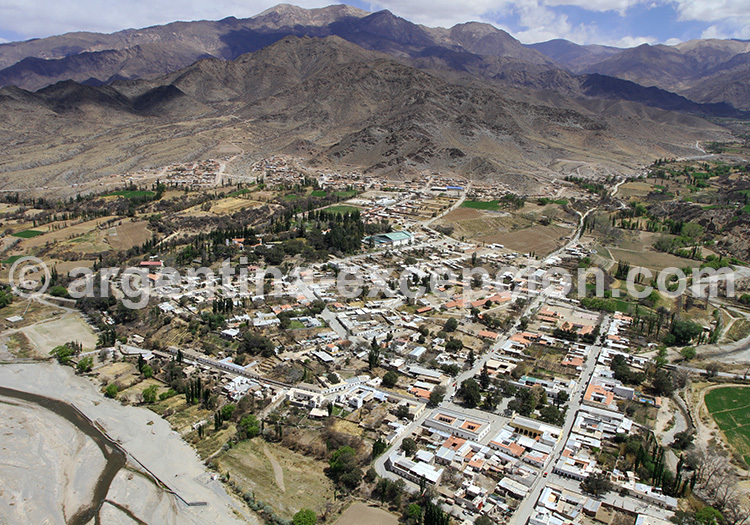 Situated in the department of the same name, la Poma is at an altitude of 3.015 m. The village has a lot of charm, even if it suffered an earthquake in 1930. The “Volcanes Gemelos” (identical twins volcanoes) dating from the first quaternary towers the place, while two kilometers away you find El Puente del Diablo, a sculpture created by nature. The Calchaqui river is very close. In the surroundings of La Poma, you can see in an immense cave grain silos from the Incan period, which served to keep the maize harvest. The small village of Cachi is found to the north of the Calchaquíes valleys; located at 2.280 m of altitude,it is surrounded by the majestic mountains of over 5.000 m. Architecture there is typically colonial: the church of San José is built on adobe, and painted in white. Do not miss the Archeological Museum Pío Pablo Díaz, which has around 5.000 pieces, gathering many ancient ceramics. To the south-west of the city, the ruins of Puerta la Paya are 10 km away. 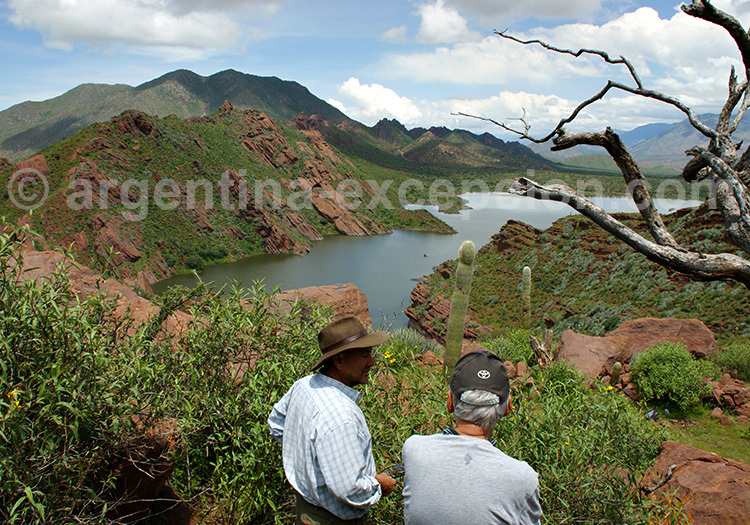 Between Angastaco and Cafayate, the Quebrada de las Flechas borders the Calchaqui River. The rubble path crosses a forest of wind-carved arrows that point skywards. An incredible mineral landscape of many colors. The town of Cafayate (12,000 inhabitants), one of the biggest in the Calchaqui Valley, is famous for its vineyards and wineries. Its specialty is the white wine Torrontés, a vine-stock that grows in this particularly sunny region of medium altitude (1700 meters – 5577 feet). Several wine cellars open their doors to the public in the town or in the surrounding area. Numerous artisans group around the main square of Cayafate, which acts as a meeting point for the inhabitants of the more isolated nearby villages. Exiting Cafayate, heading towards Salta, the Quebrada de las Conchas borders the river of the same name, which sculpted this extraordinary canyon. The most beautiful forms are pointed out with signs: Devil’s Throat, the Amphitheater, the Toad, the Friar, the Obelisk, the Castles… A natural show that explores the palette of reds, best contemplated at dawn or in the afternoon, when the sun offers better contrasts. Between Cachi and Cafayate, some kilometers from Seclantas, you find the village of Brealito, famous for its amazing lake of about 50 hectares. We get there by a mountain road with steep slopes of breathtaking beauty. 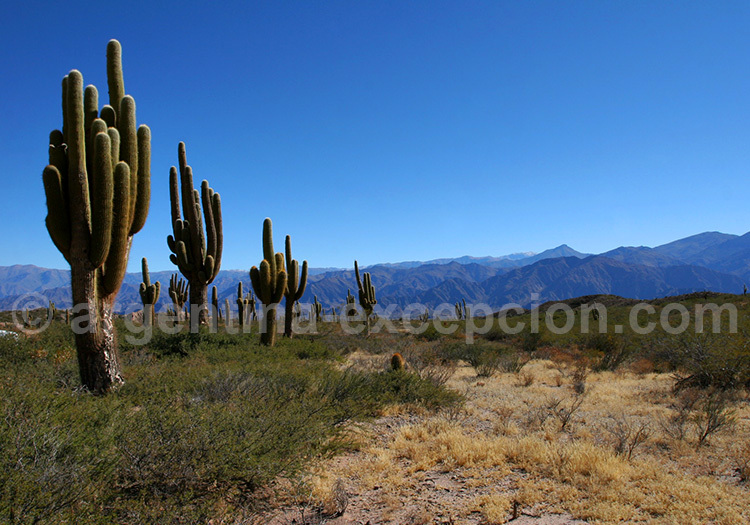 All that region is full of big cactuses some of which are over 6 meters tall and have a diameter of 60 to 70 cm. Like a mirror, both blue and emerald green, Laguna del Brealito, reflects a very unusual landscape of imposing mountains and gigantic rocks. An ideal place for trekking and cycling, you can admire water falls, cave paintings or dedicate to pejerrey fishing. This place is said to be charged with a particular energy, a witness of numerous myths, legends and stories of paranormal phenomena. 15 km from Seclantás, in the Calchaquíes valleys, we access these caves in 4×4 from the river Montenieva. After an hour trip, we enter into a valley of sandstone and stones of an intense red. 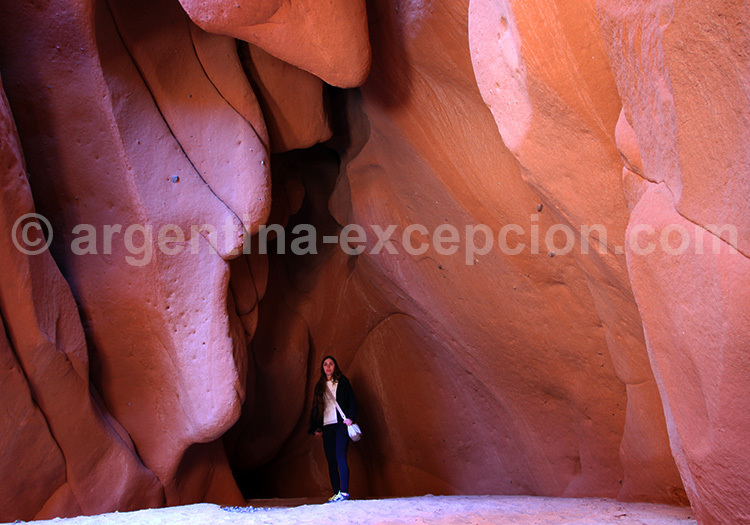 Then, by the end of the visit, the canyon becomes narrower, the bushes and cactuses gradually disappear, we pass through narrow tunnels which lead to caves of flaming red and astonishing shapes. There light filters through some gaps : we let ourselves be seduced by the atmosphere and the colors of these extraordinary caves. 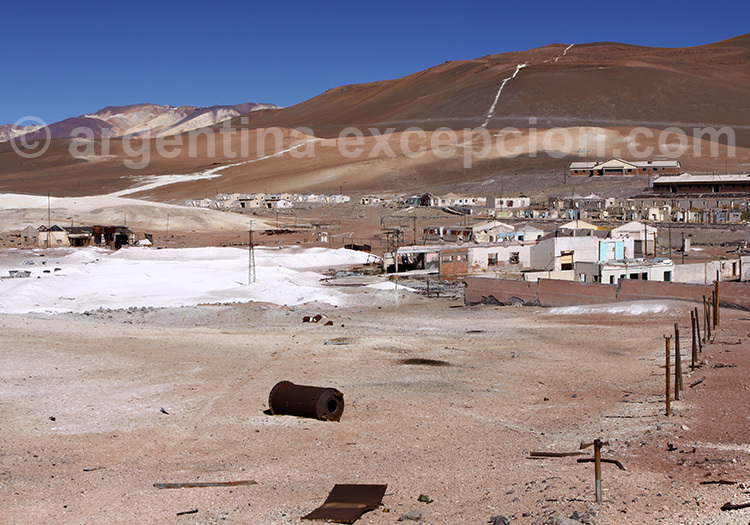 Pocitos is both a salt deposit 60 km long and 6 km wide and a village built at the crossing of many provincial routes. Route 17 is the continuation of route 43 which comes from Antofagasta de la Sierra, route 27 comes from Tolar Grande and goes to San Antonio de Los Cobres through Caucharí and 129 takes you to San Antonio de Los Cobres via Santa Rosa de los Pastos Grandes. Pocitos is also located 20 km from Laguna Seca station of the C-14 Ferrocarril General Belgrano where the lithium coming from Salar del Hombre Muerto is loaded. The Salar de Pocitos houses plenty of mining infrastructure, of which the most important is the El Quevar campsite, dedicated to silver and situated at 4.300 m at the foot of the Nevado Quevar (6.140 m). 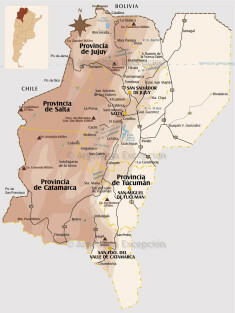 Since 2004 mining company Golden Minerals Company exploits through its Argentine branch Silex Argentina SA 14 exploitation concessions and 6 exploration concessions only in the area of San Antonio de Los Cobres. The silver deposits of El Quevar are fifth in the world ranking after Juanicipio, Greens Creek, Fresnillo and San José. Departing from Tolar Grande to get to San Antonio de Los Cobres, the road goes through the Cordon Sagrado del Macom, skirts the Salar del Diablo which is 1,3 km long and leads into “7 Curvas” (7 virages) in the desert of Labyrinth also called Devil’s Desert or Red Desert (Desierto del Laberinto, Desierto del Diablo or Desierto Rojo). 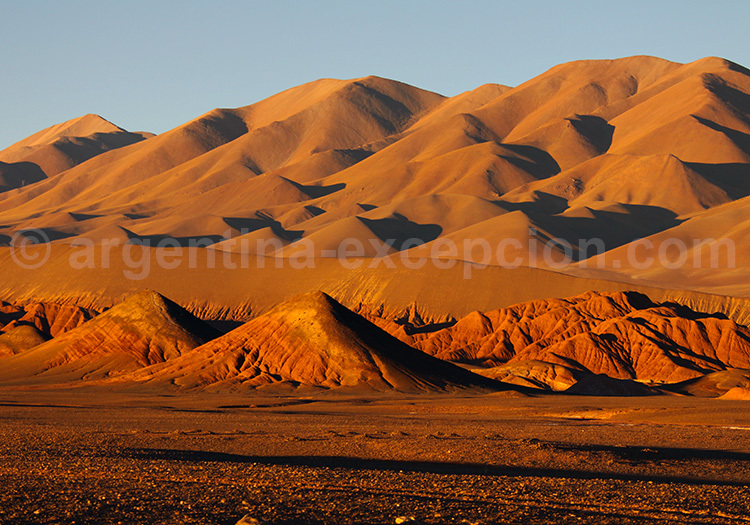 This area is characterized by many reddish sedimentary formations which offers the observer a surreal landscape. The inhabitants at Tolar Grande have named it like that because they had seen at night a figure sat on a rock called “The Table”. Partiendo de Tolar Grande para llegar a San Antonio de Los Cobres, la ruta atraviesa el Cordon Sagrado del Macom, bordea el Salar del Diablo a lo largo de 1,3 km y desemboca luego de las “7 Curvas” en el desierto del Laberinto también llamado desierto del Diablo o también desierto Rojo. Esta zona se distingue por una infinidad de formaciones sedimentarias rojizas que ofrecen a la vista un paisaje surrealista. 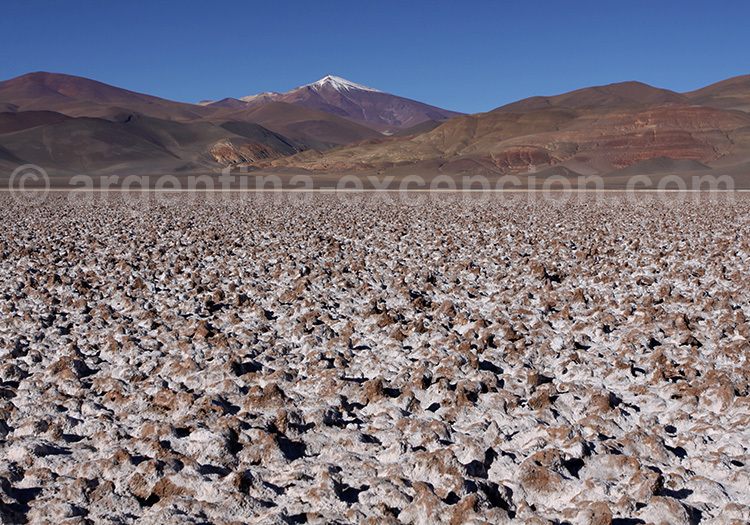 The Cordon Sagrado del Macom is the massif situated between Salar de Tolar Grande and Devil’s desert. It is dominated by Cerro Macón (5.611 m). The Macón was venerated by the incas, whose evidence of presence is found in the buildings and ceramics fragments on the East slopes of the range. Every year, the third Saturday of November, the inhabitants of Tolar Grande gathers the kolla community and organize a course whose objective is to reach the summit of the Macon holly mountain. The climbing starts at 3.900 m after a ceremony to Pachamama. This area is also worldly known for being one of the 4 best sites to observe the cosmos. The European Extremely Large Telescope (E-ELT) had doubted before finally setting up on the Cerro Amazonas to the south of Antofagasta in Chile. 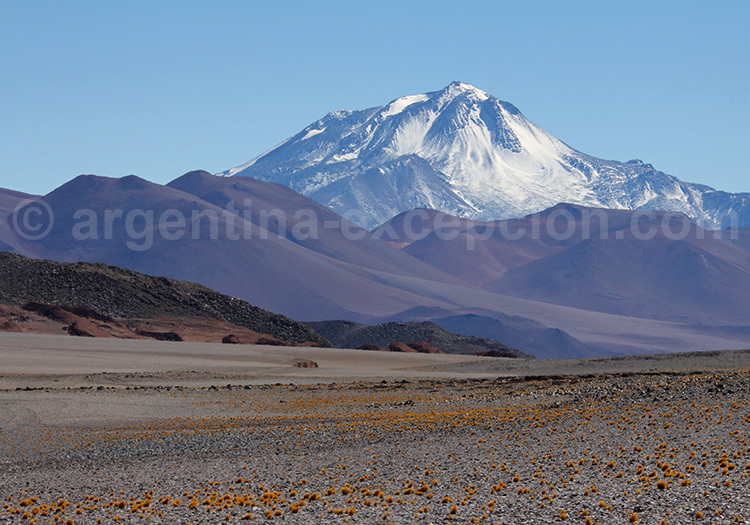 The Argentine projet of setting up an astronomic observatory at 4.600 m on the Cordon del Macom has not yet started. 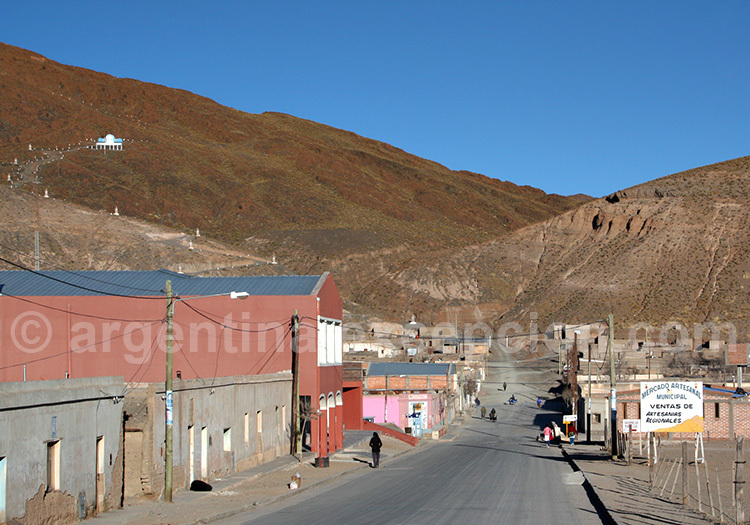 Located at 393 km to the west of the village of Salta and perched at 3.525 m in the middle of red hills and on the edge of Salar de Tolar Grande and Salar de Arizaro, the village of Tolar Grande has 180 inhabitants. 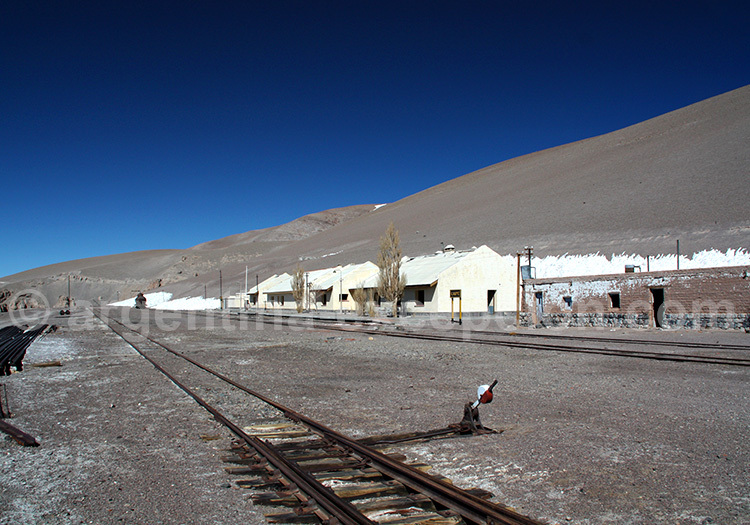 Founded at the time of the development of the mining activity of ne Julia mine (souffre) and the mine Arita (onyx), the village was an important station of the railway station of the General Manuel Belgrano line which joins Salta, San Antonio de Los Cobres and Antofagasta in Chile via the Paso de Socompa. Do not miss a beautiful excursion 13 km from the village: “The tunnel of the dead man”. It is an cave of earth and salt, 180 m long, full of stalactites, salt columns and formations of different sizes. To visit with a local guide. You can also visit Laguna Santa Maria 65 km from Tolar Grande. 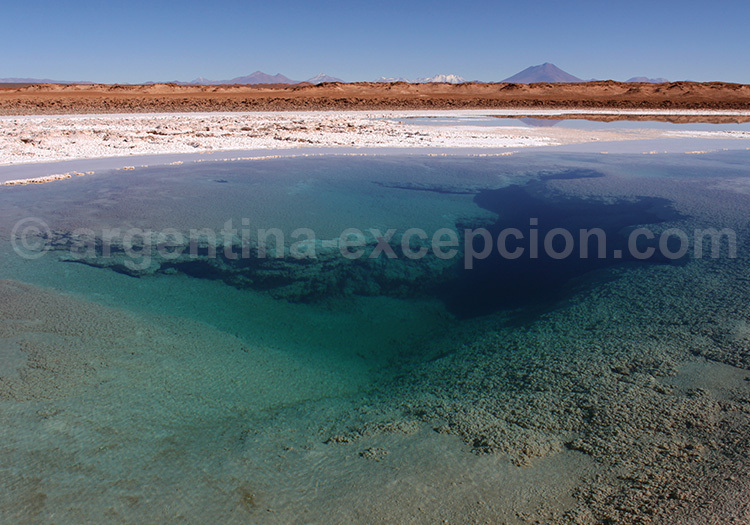 4 km from the village of Tolar Grande, do not miss walking on the small Salar de Tolar Grande (7 km long). There we discover six Ojos del Mar (eyes of the sea). These water sources, bordered by salt crust, offer beautiful shades of blue accompanied by the reflection of the surrounding mountains. These sources of water are made up of stromatolithes (in Spanish estromatolitos), microbes and bacteria which form the organic limestone 3.500 million years ago. Theses formations have allowed to modify the earth’s atmosphere. The stromatolithe has generally become fossil. There are very few places on the planet where you can still find living stromatolithes. They are in the sea areas, saline and made of arsenic. We also find living stromatolithes at Laguna Socompa and at the Atacama desert. In the XVIII and XIX centuries, the herders had the habit of using this road to guide de animals to Chile or on the opposite direction to the Argentine plains. The word Arizaro, which means ” Cemetery of Vultures ” makes reference to the numerous animals which die in the salt desert during their crossing and which make themselves be eaten by the birds of prey. We still find remnants of animals fossilized by salt. The Salar de Arizaro, which is 1.860 km2, is one of the largest salt deposits in the world. 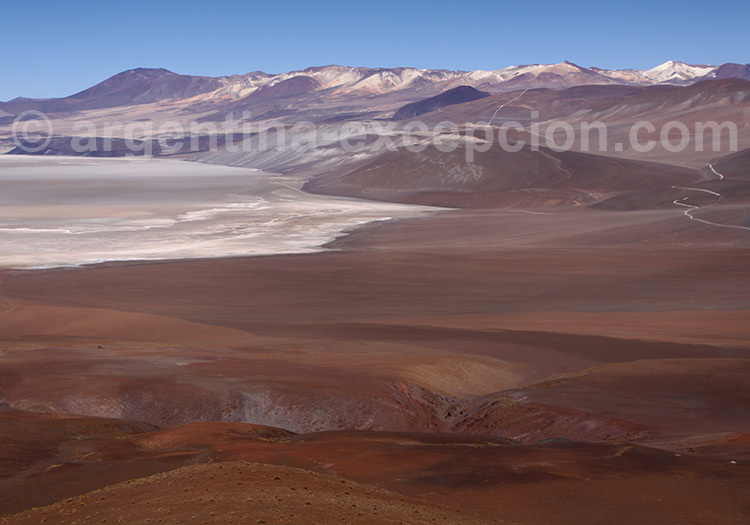 This ancient salt lake is skirted by mountains whose reddish color contrasts with the white from the Salar. We take without problems the road which crosses it, since the salt crust is sufficiently solid to support a vehicle’s weight. Very close to Salar de Arizaro there is Caipe, an abandoned ancient train station. Some wagons have been left there abandoned, witness of an old railway station. There is a project to rehabilitate it as a touristic train. 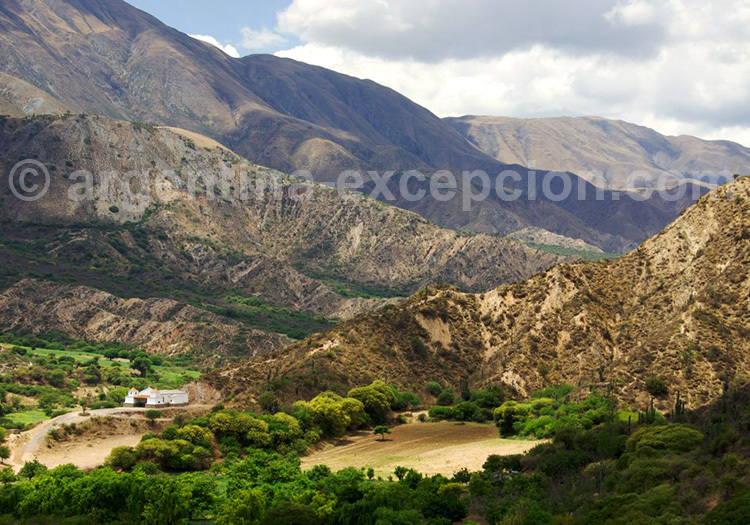 To arrive in Caipe, you must take route 51 from Salta, parallel to the Train of the Clouds. A paved road connects Caipe to mina La Casualidad, close to Salar de Rio Grande. Located in the south border of Salar de Arizaro, 70 km from Tolar Grande, the Cono de Arita is a strange volcanic pyramid. Its name, in Aymara language means “sharp”. We understand its origin while we observe this perfect cone loom majestically 122 m above the Salar. 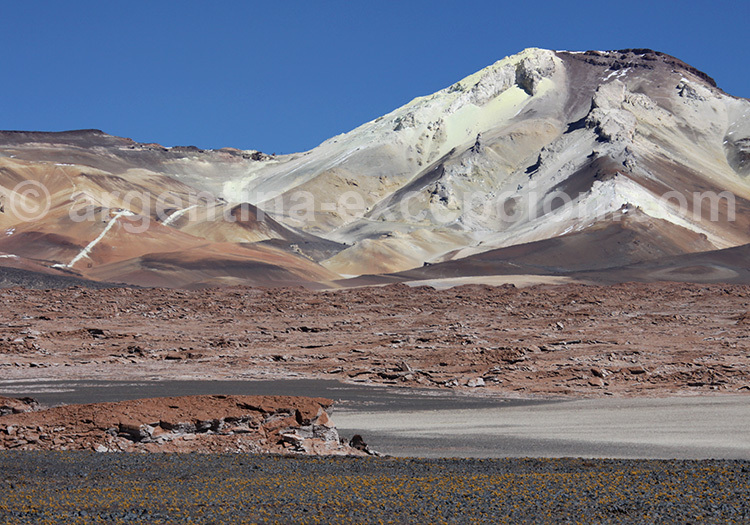 The lava of which it is made has given it this color which contrasts with the surrounding white immensity…The road leading to Tolar Grande skirts it on the west. 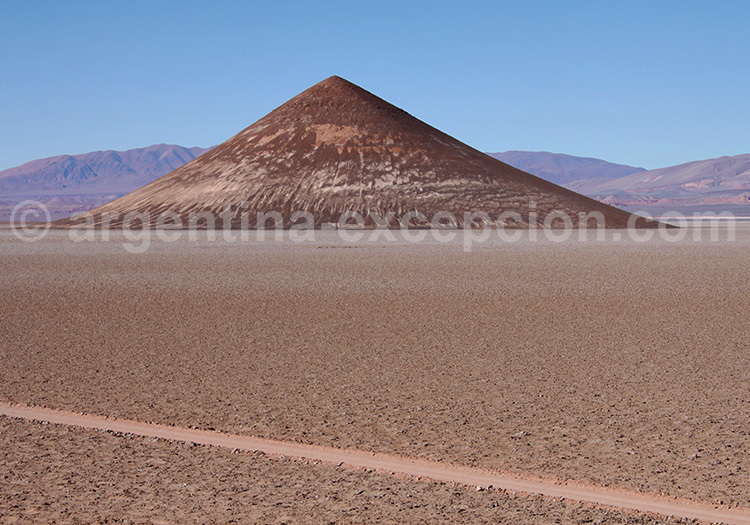 From there the cone seems very close, but distances in the Salar are deceiving ! You have to walk 1 km to get to its base. 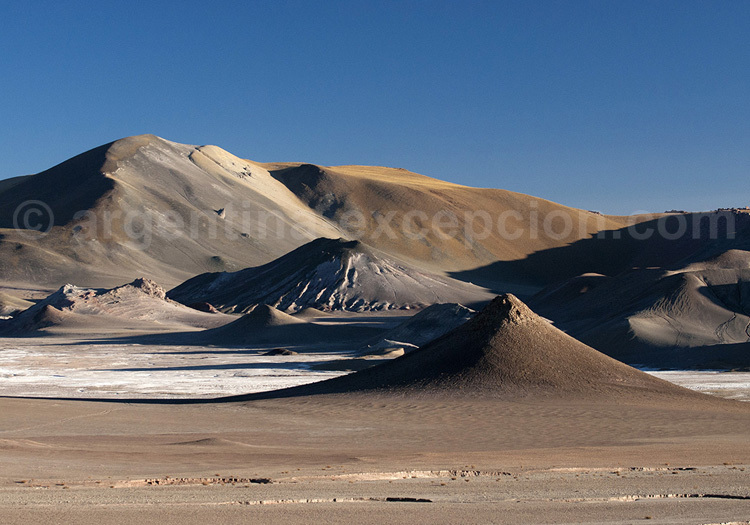 The Salar de Rio Grande is located at an altitude of 3.700 m, at the foot of the mountains exploited by the ancient mines of La Casualidad and Julia. This salt deposit is 33 km long and 7 km wide. The road which leads to La Casualidad offers a spectacular panorama of the Salar de Rio Grande surrounded by mountains of colors varying from red to yellow. The landscape makes you think of a painting. The company Sumatron extracts today anhydride sodium sulfate on an authorized surface of 105 km2. This exploitation is classed ISO 9002. 56 people work there. There is a refining factory of the different deposits of which the Salar de Rio Grande is the closest to the locality of Pocitos. 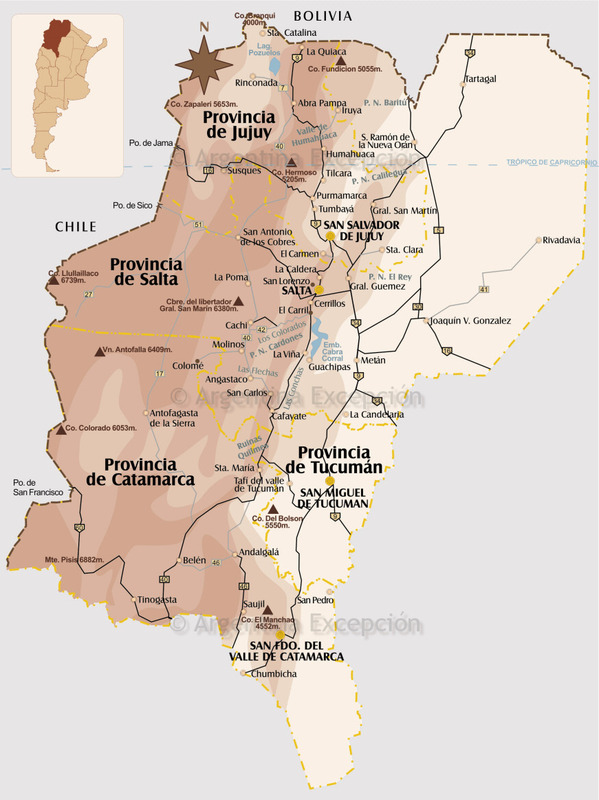 At 4.028 m of altitude, at 140 km from Tolar Grande and 533 km from Salta, 8.342 persons in all have lived at Mina La Casualidad between 1951 and 1979. 3000 persons occupied it at the moment of the greatest activity and 2000 lived there at the moment of closing. At 1.2km from the town there is the cemetery which includes 288 tombs (400 persons). It now seems a phantom village made up of small houses, a church, a cinema and a theatre, shops and a school, a post office, a basketball and football field. The mine had as vocation the refinement process (heat treatment) and the flotation (adding of chemical elements to obtain 99.9 purity) of sulphur extracted from mine Julia. Sulphur was used for agriculture (fertilizer) to make explosives and to industry (sulphur acid). At 150 m from the church, there is a 4 meter basin of sweet water “La Vega” having the characteristic of being in constant boiling and of never freezing. Situated at 5.200 m on the border with Chile and at 25 km from mine La Casualidad, It is there that sulphur extracts were accumulated in the artificial galleries of the surrounding mountains. It was then transported in wagons on a 15km long cable, then turned in the basin of the complex La Casualidad to start the treatment. 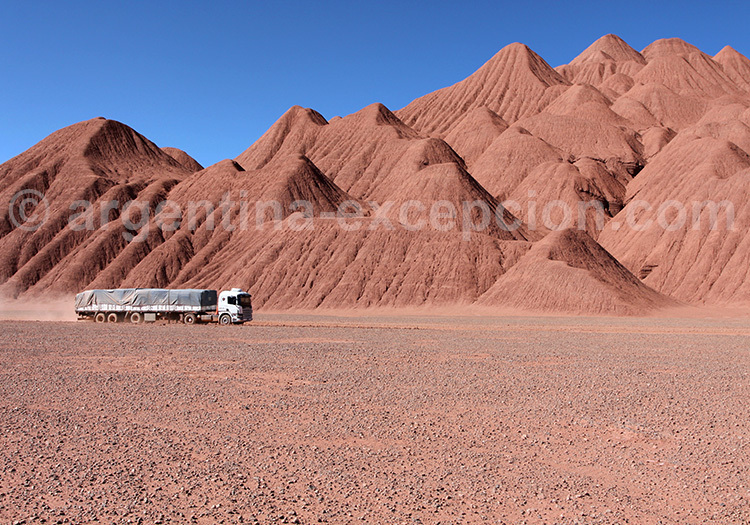 Sulphur was then taken by truck to the train station Caipe to be taken to Salta or Antofagasta in Chile. At 3.876 m of altitude, at the foot of the Socompa volcano, there is the border passage of the same name. It is a railway passage which joins Salta with the Chilean port of Antofagasta. There is a road also which is recommended to be taken with an ATV. 500 meters separate the Chilean and Argentine border posts. Very close you can find the magnificent Laguna Socompa, still unknown for travelers who try to adventure in this region. The volcano Llullaillaco is located in the border between Chile and Argentina, in the Andes range. 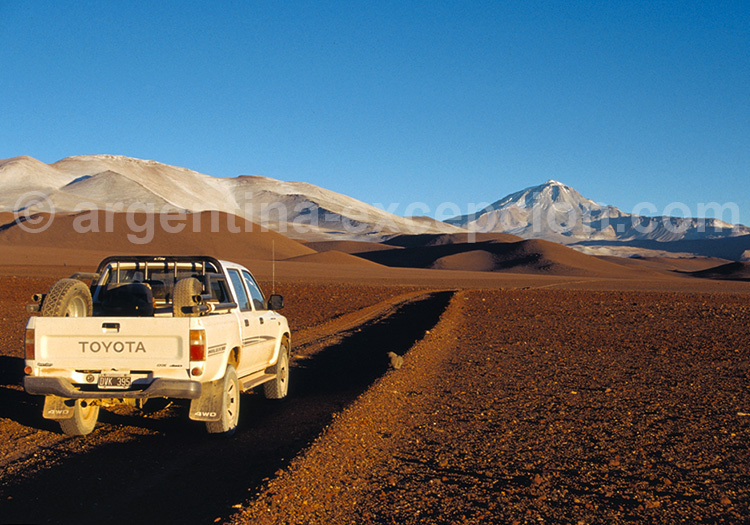 For the Chilean side, you access there by crossing the Llullaillaco National Park. Its summit is at an altitude of 6.739 m, this volcano has erupted since 1877, even if it is considered always active. Glaciers, snow and volcanic rocks make the slopes of Llullaillaco. As in numerous summits of the ancient Incan Empire, the archeologists have found there the corpses of sacrificed children mummified by freezing. The three mommies found in 1999, called the “Niños del Llullaillaco“, are preserved in the Museo de Alta Montaña in the city of Salta. In northwestern Salta, on the Bolivian border, lies El Baritu National Park, which is shelved between two mountains and difficult to access. It is the only tropical park in Argentina, and extending over 72,000 hectares, it protects numerous endangered species of birds. 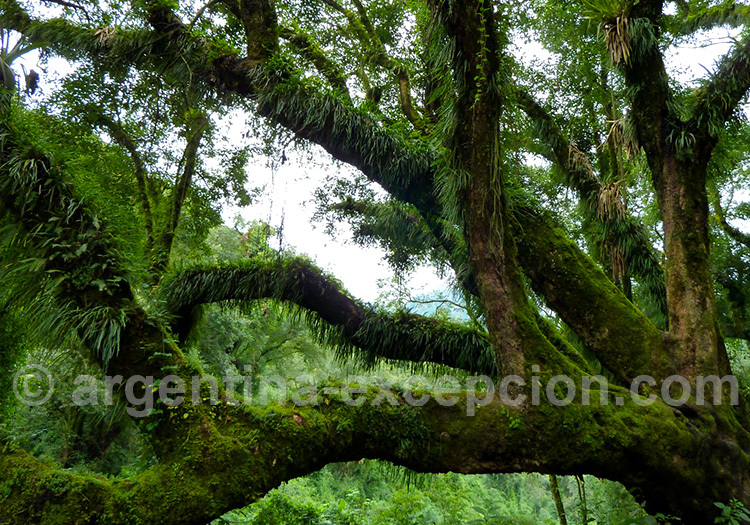 This forest, similar to the Yungas, houses the Strangling fig, an epiphyte plant which with time becomes a parasite and asphyxiates the trees it grows on. Among the wildlife, we can mention the yaguarete, an endangered jaguar, the ocelot, the tapir and a great diversity of snakes. A rich ecosystem to visit from June to September.